1. 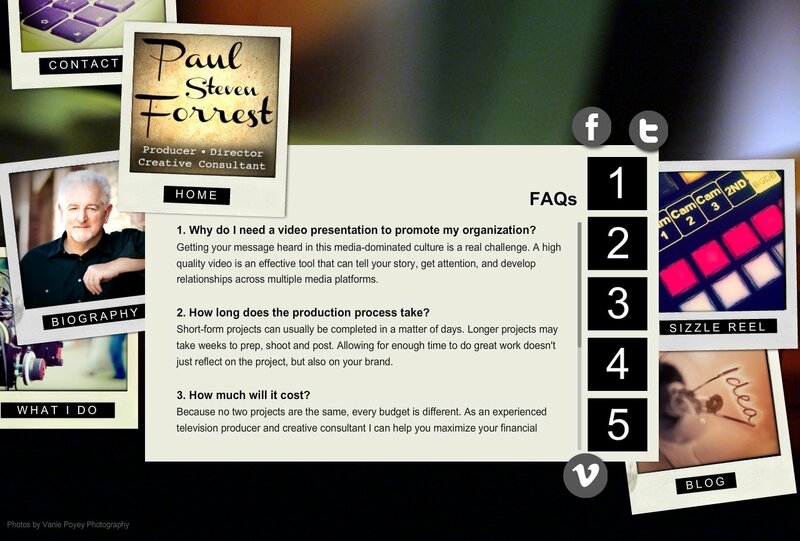 Why do I need a video presentation to promote my organization? Getting your message heard in this media-dominated culture is a real challenge. A high quality video is an effective tool that can tell your story, get attention, and develop relationships across multiple media platforms. 2. How long does the production process take? Short-form projects can usually be completed in a matter of days. Longer projects may take weeks to prep, shoot and post. Allowing for enough time to do great work doesn't just reflect on the project, but also on your brand. Because no two projects are the same, every budget is different. As an experienced television producer and creative consultant I can help you maximize your financial investment. A detailed proposal and budget will show you what your custom project will cost up front. 4. Should I consider producing a TV program? The most effective platforms are a combination of traditional and new media. The way media engaged your audience before is no longer the way it impacts them now. Finding better ways to tell your story is an important part of what I do. 5. How can you assist my media team? My creative passion is to provide a fresh perspective, valuable experience and cutting-edge thinking. As a teacher and mentor, the ideas I'll bring, the principles I'll share, and the techniques I've developed, are designed to energize every member of your team.